Alison moved to New York prepared to dive into her career, commit to her friendships and, after getting settled, adopt a pet. At her six-month mark, she knew she was ready to adopt. Alison grew up with dogs, cats and horses, and had a feeling that a cat was the right pet for her busy lifestyle. She started browsing Petfinder to learn more about the adoption process and was surprised that there were so many pets on the site. “I was head over heels for a new kitten almost every day,” she says. In the end, her perfect match came in the form of a work assignment. A client was fostering kittens, and a shy calico named Zoe caught her attention. 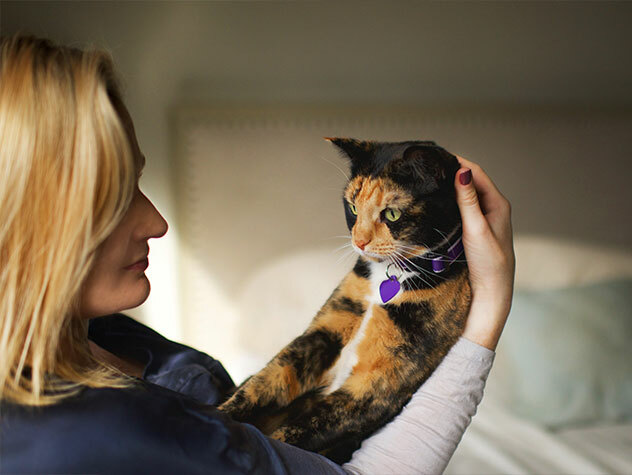 “She totally confirmed that I couldn’t live my life without a cat,” Alison says. After a few weeks, Zoe had gone from a shy cat to Alison’s shadow, and it became clear that Zoe had found her forever home. When you’re ready to start a family of your own, search adoptable pets in your area on Petfinder. Have a Happy Tail of your own to tell? Share it with us here.